The Saluki is a breed that has originated from Aisa, and travelled through out far lands in the Middle east. These dogs were bred to hunt by sight- Rabbits, foxes, jackals and gazelles. Because this breed was so important to the Egyptian culture, they were ranked amoung royalty and often mummified. 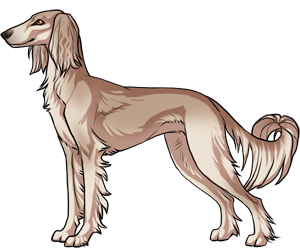 The Saluki was used by the Arabs hunt down gazelle with there stunning speed.